Audit your website. Because you never get a second chance to make a first impression. According to an article on Forbes.com, about two-thirds of American adults see search engine results as the most trusted information about people and companies. And the majority of your potential clients will check you out online before they call. The bottom line: if your website doesn’t represent you and your business well, you’re missing out on a lot of clients. But how do you know if your website is doing the job it’s supposed to do? 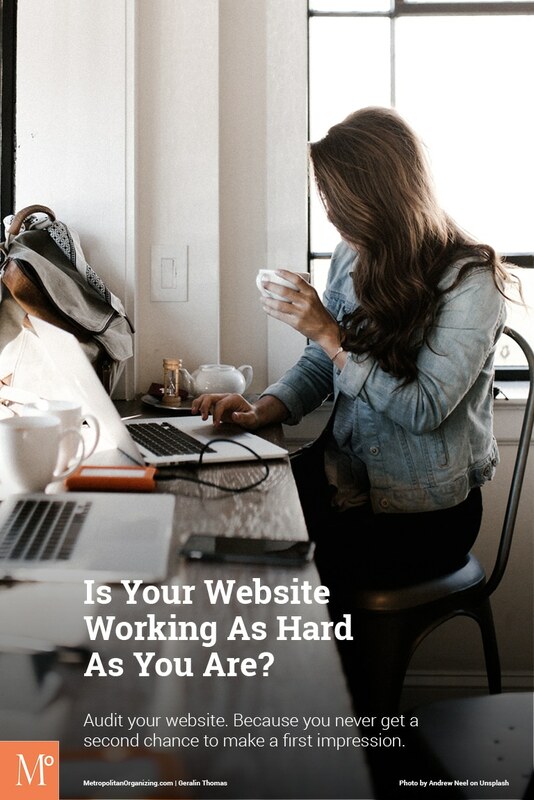 Most productivity and organizing professionals know that they need a website, but they don’t always understand clearly why. So, consider the implications of the statistics that Forbes shares. Your website is usually the first point of contact between your business and your potential client. Remember that we never get a second chance to make a first impression, so treat your website as the first-impression opportunity that it is. Let’s look at each one in turn. A brand is to a business what a personality is to a person. It’s who you are and what you’re known for. If you are a solo entrepreneur, your brand and your personality may be very closely connected, but pay attention to how they connect. See if you can describe your brand in just a few key words. Are you a crisp professional? Or the warm, supportive friend? Does your business handle large moves with an impeccable organization? Or help elderly clients who are making the emotionally difficult choice to downsize? Each of these descriptions of your business brand or “personality” will require different choices around your website and social media accounts. If your brand is known for handling large moves impeccably, your website may be written in the third-person (“Impeccable Moves Organizing will ensure that your experience is fast, affordable, and trouble-free…”) You may choose a more business-like font, not a swoopy handwriting font. And your colors may be more subdued, avoiding lavender or pink in favor of dove-gray and steel-blue, for example. But if your brand specializes in elderly clients who are downsizing, you may opt for text that is written in the first-person (“I will hold your hand every step of the way…”) Your images may focus more on cozy homes and happy older clients. And your font choice may be something a little more relaxed than a straight up-and-down classic serif font that you’d find in the newspaper. Whatever your brand is, make sure that your website and social media posts proclaim it loud and clear. Use images, language, colors, and fonts that support your message to your ideal client. Don’t use a layout that will confuse your visitors. Follow online best practices, with a header, then your content, then a footer. Use top or left-hand navigation bars. Check your spelling and grammar. Mistakes do not support your reputation as a business that does an error-free job. Fix broken links. You might ask a friend or colleague to spend an hour clicking through your site to make sure that everything leads where it should if your site has few pages, or for a larger site, ask your developer to use a tool such as Check My Links. Check your website on all the major browsers. Just because your webpage looks great in Google’s Chrome doesn’t mean it’s perfect in Safari, Microsoft’s Edge, and Firefox. Meet your clients wherever they are by checking your site across all the major platforms. Many people use their mobile devices almost exclusively for browsing the internet so ensure your website looks good on mobile devices too. Just enter your own website address into Mobile Friendly and you will instantly see what it looks like on a smartphone. You can also install a Chrome browser extension that will allow you to quickly see any page on your website as if viewed on a mobile device. Finally, give a clear call to action. Don’t make it hard to find out how to contact you. If you have an email form for clients to contact you, consider linking to it on every page. If there is something you can offer to clients to solve their problems, don’t hide it! Your online content should be relevant to your ideal client. Be sure you’re addressing their concerns. Are you speaking to their greatest needs? Are you using the words they would likely use? Describing your service area clearly will help anyone who is searching for an organizer by location. Keep your content “fresh” by adding relevant white papers, posting new testimonials, filling your twitter feed with useful tips, or creating a blog. Don’t treat your website like a billboard that you can put up and forget. Give people a reason to read your site by providing great information they can’t easily get elsewhere. Humor can work if the content is something that’s funny to your ideal clients. I had fun putting together a Pinterest board called “The Imaginary Butler,” to go along with more content-rich boards on closet organization, starting your organizing and productivity business, a month of “Tiny Tasks,” and other resources. It’s also worth noting content to avoid. For most businesses, it will be best not to mix political or religious views in with business messages. If your business caters to other businesses, cute kitten pictures may not attract clients, no matter how cute they are. Always keep your clients’ concerns front and center. Most people who look for something online don’t look past the first page of search results. This means that you will want to target your website so that your business comes up high for what you do. Are you Springfield’s source for trouble-free corporate moves? Or do you serve Antelope Valley seniors who are ready to downsize? Savvy shoppers will be looking online for someone to meet their specific needs. Be sure to use the terms they search for, so your website comes up first. Pay attention to keywords. What do people ask for when they are looking for someone like you? One person might look for “home organizers in Springfield” while another might search for “can’t get the car in the garage because of junk.” To help people find you faster, use all the words in your site that your ideal clients might use. Do you use meta-tags on your web pages? Meta-tags are words that don’t show on your page itself, but they help search engines define the content on your web page. The most important type of meta-tags is description tags and keyword tags because these are crucial to helping search engines recognize what your website it about. If you are technically savvy, you can get information about all the types of meta-tags here. If this technical detail is far outside your wheelhouse, talk to your web master or developer to make sure that your website has effective tags in place to raise your pages in the search rankings. Your online presence is more than just your webpage. Making sure that your social media presence supports and enhances your brand can help more of your ideal clients to find you easily in their online search. If possible, choose social media names that match your business name. Impeccable Moves would ideally have “www.impeccablemoves.com” as their web address and “@impeccablemoves” as their name on Twitter, Facebook, YouTube, Pinterest, and Instagram, and any other platforms that arise in the future. If you’re an organizer serving the city of Springfield, you might choose “springfieldorganizer” as your social media name. If it’s not possible to match your business name you can still choose names with a powerful social media appeal. For example, Ellen Delap, an organizer based in Texas, uses the website https://professional-organizer.com/ and the Twitter name @texasorganizer. Ellen has an active twitter feed which is the source of many of her clients. It’s also a great way for journalists to find her. Make sure the photos and posts on social media related to the brand identity on your website. Never confuse your potential client by showing a different brand on one site than you display on another. Include links to your blog or posts on your other social media feeds. This can help your ideal clients pick you out of the crowd. When you put out an online welcome mat, you want to assure visitors that your site is safe. Make sure your website has an SSL certificate, which assures visitors that your site is authentic and your contact form is secure. There are several services that tell you how your website stacks up against others. One is Hubspot’s Website Grader, which gives helpful information in performance, mobile, SEO, and security. Hubspot has a very useful article on 13 SEO tools to audit your website, including some free resources. The internet is an incredibly powerful way to reach potential clients who are looking for what you offer, and the price of reaching them is super low – IF your website is working hard to introduce your ideal clients to who you are and how you can help them. Evaluate your online presence to make sure your website is helping you as much as it should. If you’re a professional organizer, who is looking for an objective eye to help you evaluate your website and make it as effective as possible for your organizing business, call me for organizer coaching. Ensure your time zone is correct on the right side of the box. Pick a day and time that works for you from the slots on my schedule. Fill out some basic information including name, phone, email, and add the appointment the the schedule. Review the confirmation email and ensure the details are correct. Add the appointment to your schedule and save the email. If you need to cancel or reschedule there is a link in the confirmation email. 24-hour notice is required for cancellations and rescheduling. Helping professional organizers create sustainable, successful organizing businesses is what I do. If you could use specific advice on this topic, consider some 1+1 Career Coaching for professional organizers. Please share if you found this article helpful!